First time posting on location, as in, at the place and time I’m making watercolor sketches. I’m at Point Pinole in the east bay and it’s windy in a glorious way. The clouds are zooming across the sky, a fierce little kite is screaming at every noise, so it’s time to move on. The color of the golden grass and the groups of trees are pure California. 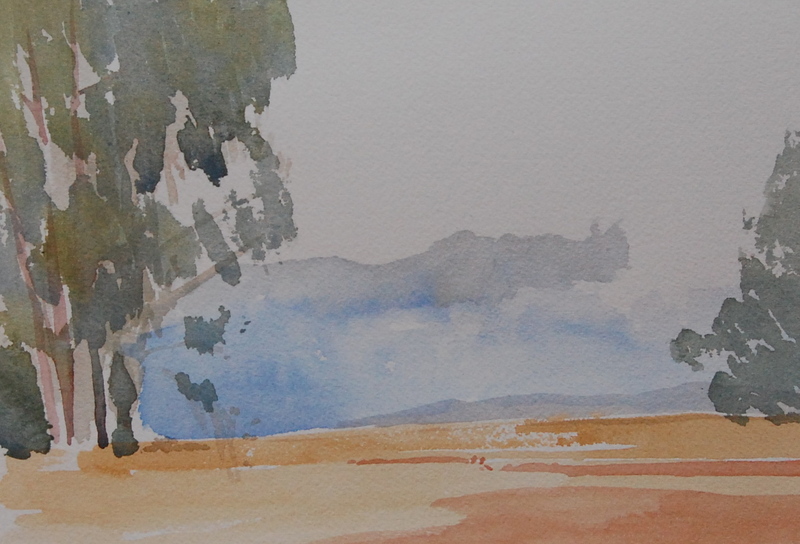 Saw the exhibition of landscapes at St Mary’s College yesterday – the Epperson Collection – made me want to rush out somewhere wild and do some work. There was a huge white cloud when I started this sketch that I wanted to include, and by the time I had finished and was able to take this pic, the clouds had receded into the distance, and the wind had picked up. This entry was posted in Art Journal and tagged watercolor. Bookmark the permalink.